Home News Morocco Is Morocco’s new constitution an ‘Arab Spring’ antidote? Is Morocco’s new constitution an ‘Arab Spring’ antidote? With the fragrance of Jasmine wafting through the Arab world, more and more countries were swept up in the “Arab Spring” that resulted in the fall of strongmen in Tunisia and Egypt and sounded the death-knells for regimes in countries ranging from Yemen to Libya. Morocco, a Muslim nation of 32 million people, faced unrest over issues of unemployment, poverty, corruption, good governance and education. Instead of using guns and tear gas, the Moroccan government chose a different tactic: sweeping constitutional reforms. But the question remains whether Morocco’s path is a path to bringing change to the Arab world or simply another attempt by another regime to diffuse discontent. “We are not saying that we don’t have problems. Continuous reforms are the best way to improve the situation. That’s why we have this new constitution,” Moroccan Ambassador to Indonesia Mohamed Majdi told The Jakarta Post on Monday. Moroccans across the world, including some 100 in Indonesia, voted last week on a new democratic constitution, despite a call to boycott by the opposition group known as February 20, a loosely organized collection of bloggers, activists, leftists and right-wingers. “We had voter turnout of 73.46 percent in the referendum vote. It was massive participation,” Majdi said. According to the provisional results announced by the Moroccan Interior Ministry, 98.50 percent of the voters favored the new constitution, Majdi said. The much-awaited new constitution will provide more executive powers to the prime minister, strengthen the judiciary system, emphasize gender equality, remove the sacred status of popular King Mohammed VI and facilitate strong measures to promote transparency and fight corruption, according to a draft of the constitution seen by the Post on Monday. Morroco would be “a sovereign Muslim state, committed to the ideals of openness, moderation, tolerance and dialogue to foster mutual understanding among all civilizations”, one of the draft articles read. The draft also highlighted human rights. “We have a full-fledged charter on human rights in the new constitution,” Majdi said. However, the king will retain his position as head of the defense forces, religion and the judiciary. It appears to be a model for change in the troubled Arab world. During negotiations with the government of Bahrain, Shiite opposition there called for a similar draft of reforms. “It could serve as a model,” Bahrain’s Shiite leader Wafeq told reporters in Manama. 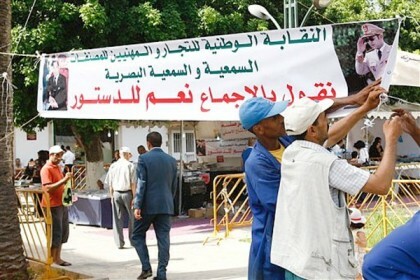 Disappointed with the failure of its boycott rally, the February 20 group cited several irregularities in the referendum vote and called for massive demonstrations across Morocco on Sunday. “Demonstrations are allowed in our democratic system. Every day we have scores of demonstrations. It’s not a problem, “ Majdi said. The US and EU praised the referendum. “We welcome the referendum as an important step in Morocco’s ongoing democratic development,” US State Department spokesman Mark Toner said in Washington on Friday.